The past week site hits have been down about 25%. Can you guys help in spreading the word? The more people on the site, the bigger the database grows! Tell your friends, your guild members, say it in the World Channel, and tell the people on the official forums if you think the site can answer their question! Meanwhile, I'll be working on more nice site updates just for you guys! I m already busy to advertise this site to everyone and also to give tips about this site. I did it already before I went on holiday to Malawi. It amazes me that there aren't more people here überhaubt. It's (in my opinion) the best source for wonderland info. The wiki is rubbish, the only good site I know of, is that compound site (wich also lists the chinese items that have yet to come for us). I'm not really a forum user on the official wonderland site, so spreading the word would be hard. And you should also pay attention that advertising to much in the worldchannel may get you a warning, because it can be considered spam. 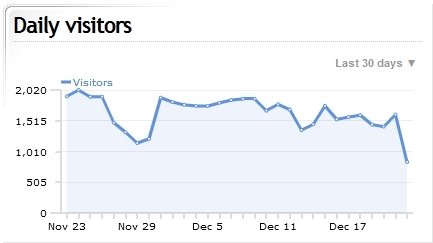 the big dip a couple weeks ago is when i had server issues over thanksgiving. since then i have upgraded the server though so the site has been fine. Ah, don't worry, scott. I am sure they are very busy with the Christmas and New year events. So, your site will be back to normal after the events and also even better. I've been trying, myself, before I saw this forum. So far I think I've only gotten 4 ppl, but I'll keep on tryin ;) I lovesss dis site! I can't help wut I hear in my head. n I dunt wanna feel, my heart is breakin. n I dunt wanna feel, my life is burnin. omg, am I loosing it? thanks everyone for the help so far! tiyiakatigger, what about the google translation of the page? i don't know spanish very well so it would be a little hard to do the translation without a lot of help. Will certainly tell the few that I know playing, to check your great forum. Also in other servers i send em here and its my tent name and nickname!!!!!!! I know this is the best site ever, I been promoting it from the first time that I was lucky enough to find it. I think, lots use it, they might not just register. I know, I did not for months. I will continue to promote site! Keep up the the good work all!! Sure though, I refer the site to lots of people. they like this site and give the link to others as good advice..
" want to know how to make ur own items? " " wanna contribute with ur formulas? " " wanna know something about the game? " " come a visit http://woldb.com Wonderland Online Data Base "